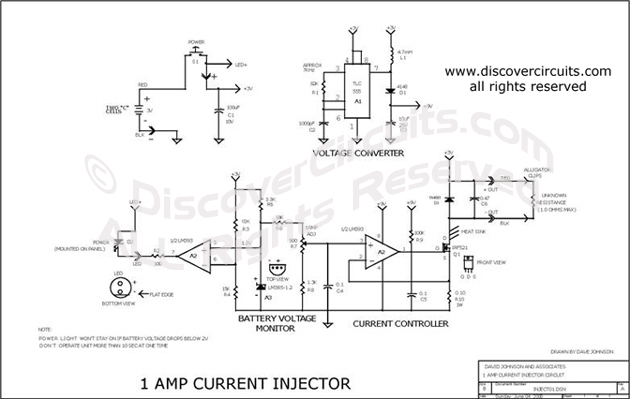 Circuit: 1 AMP CURRENT INJECTOR__ Circuit designed by David A. Johnson, P.E. Have you ever been frustrated with your digital multimeter (DMM) when trying to measure resistors below one ohm? Most meters will only display a low value resistance down to the nearest 0.1 ohm. This project shows you how to build a DMM accessory that will enable you to measure accurately a resistance down to the nearest 0.0001 ohm. The unit injects a precise 1-amp of current into the resistance to be tested. You simply use your DMM to measure the voltage drop produced by the injected current. With typical meters, resistance from 1.5 ohms to 0.0001 ohms can be measured with the aid of the current injector. Two "C" battery cells power the injector circuit and features a power indication light which doubles as a weak battery indicator. If the batteries need to be replaced during operation, the light will fail to turn on. You should may uses for the unit. I have used it to measure shunt resistors, circuit board trace resistance, relay/switch contact resistance and motor/transformer winding resistance. You also can use it to determine a wire gauge by measuring its resistance per unit length and to test diode rectifiers or transistors at 1-amp. The Circuit shows the schematic diagram for the One-Amp Current Injector circuit. The circuit divided the operation of the unit into three main sections: power supply, current Controller and battery voltage monitor.